Since we started our financial journey together, we’ve explored long-term savings concepts, geared mostly for your retirement. But what about that special something, those big-ticket items that everyone has to consider sooner or later? Goals-based investing is a fantastic way to ease the financial pressure on you when it’s time to buy that car, or more importantly, to save for a deposit on a home – or even to help pay for that special day. Personally, I’d love to be saving for luxurious holidays, sneakers or even overpriced weekly spa treatments. However, those aren’t the most sensible options. A good guide would be to plan and save for the expensive “must-haves” and treat yourself to that spa only when you’ve got cash to spare. Let’s use a fictional case study to see what millennials could possibly be saving for. Thandi Mhwanazi (24), has graduated with her honours in Mathematics at the University of Cape Town. 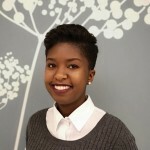 She’s just started working in the hustle and bustle of Joburg as a data analyst in a global firm. She earns R26,000.00 a month. She’s taken out a retirement annuity (RA) using the recommended 15% of her salary and invested her tax saving from her RA into a TFSA. She has also put a small portion of her savings into ETFs and manages to stash a bit into a 32-day cash call account. 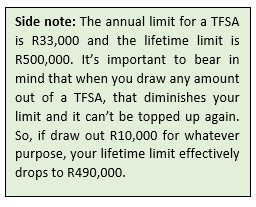 In the graphics below, Thandi has created a short-term plan targeting savings for specific goals and a long-term plan for her retirement. For the short-term plan, she’ll increase the amounts she invests each month in her ETFs and call account. For each goal, she will need to determine how much she needs to save over what period. For example, she wants to save R90,000 over five years for a deposit on a house/flat, so would need to put away R1,500 a month. Any growth in the investments, eg, returns from the ETFs or interest received from the call account) is then a bonus and she’ll be able to pay a bigger deposit, thus reducing her monthly bond installments. While Thandi has elected to save through her ETFs and call account, there are a range of other investment products that suit goals-based investing. Speak to your financial adviser for the option that suits you best. Thandi will be using her ETF and call account investments to pay for big-ticket items. This does not mean she should stop the monthly contributions to her long-term investments – those are in fact the priority. If she is in the unfortunate position of having to choose, the retirement savings should always trump short-term savings. 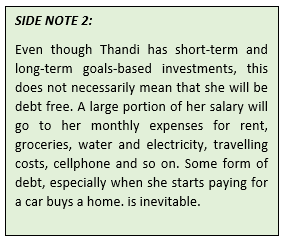 The hope is that, as Thandi progresses on a successful career path, she will earn a higher salary and therefore be able to contribute larger sums to her short-term savings. Once she is married, owns a car and a home, she can start increasing her long-term savings. 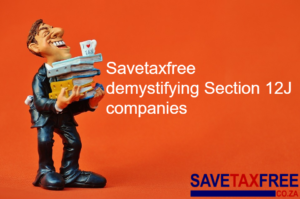 We want to hear about your investment experiences on savetaxfree. Send your submissions to mtwala@intellidex.co.za and you could be published.